Evaluating rare earth projects is a tricky business, and the ambiguous reporting methods some companies use don't make it any easier. In this interview with The Mining Report, Ryan Castilloux of Adamas Intelligence examines misleading metrics that hide the devil in the details. He also explains the complex, objective methodology he uses to rank the world's 52 most advanced rare earth projects, and names five development-stage projects and three exploration-stage projects with lucrative upside potential. A must-read for anyone interested in rare earth elements. The Metals Report: What implications will recent news of China's rare earth element (REE) industry consolidation have on prices in 2014 and beyond? Ryan Castilloux: In the near term, it will firm up REE prices in China and elsewhere. This consolidation is part of Beijing's larger efforts to stamp out illegal REE production, phase out inefficiencies and secure China's position as the world's lowest-cost REE producer and supplier. TMR: How significant is illegal REE production in China? RC: China has two competing REE industries: legal and illegal. This results in an abundance of REE suppliers. End-users are aware of this and exploit it by shopping around. They use the last guy's offer to negotiate a lower price with the next supplier, and ultimately, the spread between prices widens, and prices trickle downward. China's consolidation plans aim to remedy this situation. The Baotou Rare Earth Products Exchange shares this goal. In the long term and in the context of the recent World Trade Organization (WTO) ruling against China's REE restrictions and tariffs, consolidation is a power play. It aims to drive down production costs, so that China can undercut emerging suppliers, should it find its grip on the industry weakening. TMR: How powerful is that grip? RC: China yields separated rare earth oxides (REOs) at costs that no one else can match. In the mid-1990s, China exploited this fact to dramatically undercut global REO prices, which resulted in the end of production from most other regions—most notably the U.S. with the closure of Molycorp Inc.'s (MCP:NYSE) Mountain Pass mine. For almost a generation, China has enjoyed an enduring monopoly on global REO supply. It has also absorbed most value-added production capacity in the supply chain by attracting foreign manufacturers to set up facilities in China. It's secured its monopoly against the emergence of foreign competitors through the use of export restrictions and taxes. But China now faces the possibility that the WTO ruling could lead to a softening of its industry policies. Its strongest defense without these policies is to cement itself as the global cost leader so it can undercut foreign producers if it feels the need. The outlook was much different in 2010, when many were predicting REO demand would double by 2016. At that time, I do believe China wanted to see the emergence of foreign producers, but demand hasn't grown much since then. As a result, any new producers that emerge in the near term are going to take a significant bite out of China's market share. If its market share begins eroding too quickly, China may again slash the competition by cutting REO prices. So while prices are likely to strengthen in 2014, they could head lower over the long term. TMR: Do current REO prices provide the support necessary for new REE projects? RC: Generally, REO prices are about where they were before the 2011 spike, with the exception of the critical REOs (neodymium [Nd], dysprosium [Dy], Europium [Eu], terbium [Tb] and yttrium [Y] oxides), which are slightly higher. There's been a lot of groaning from investors since then about how prices have come down to levels that challenge the feasibility of many projects. But in actuality, prices are quite similar to what they were in 2007–2009, when many of these projects emerged. TMR: After the 2011 price spike, many REE end-users began looking for substitutes. Have they found any? RC: Many end-users have been trying to replace or reduce the amount of REOs or REEs they use in their products, since even before the 2008 economic crisis. However, rather than substituting REEs entirely, they have instead reduced the amount they use in many applications. A car, for example, can have as many as 50 electric motors in it, most of which utilize REE-bearing permanent magnets. Substituting some of these with motors that don't use REEs can go a long way toward reducing costs and supply risk. For instance, BMW's Mini E electric car and Tesla's Roadster are both powered by induction motors, which don't use REE permanent magnets. TMR: To what extent is an optimistic outlook for REEs dependent upon explosive growth in the adoption of new technologies such as electric cars? RC: The optimistic outlooks for REO demand that dominated headlines in 2008-2011 were entirely based on forecasts of explosive demand growth for technologies such as electric cars, wind turbines and ubiquitous gadgets and electronics. The demand for these technologies is still growing strong in most cases, but the amount of REO or REE consumed on a per-unit basis for many applications has decreased, leading to slower REO demand growth than predicted. Somebody once told me that any forecast on future demand is wrong, and I think that's a relevant statement, especially for the nascent REE industry. It's important to realize just how young the REE industry is compared to other industries such as copper, aluminum or steel. We've only realized a small fraction of the potential applications, which will depend on REEs in the coming decades. It's all about the performance versus economics. If REEs are the optimal material to be used in an application for performance, but translate into very high prices for the end-user, technology developers will likely sacrifice some functionality or efficiency to stay competitive. The question is: How can developers reduce their REE needs without making sacrifices that will reduce their competitiveness and harm their brands? TMR: What will lower long-term REE prices mean for explorers and developers outside China? RC: It means that tomorrow's producers will need healthy profit margins to endure potential downturns in pricing. Producers that yield significant revenues from non-REE byproducts will be able to protect themselves against REE price volatility. That's definitely an advantage. Unfortunately, there aren't many projects with that potential. TMR: Could you name some? RC: Orbite Aluminae Inc.'s (ORT:TSX; EORBF:OTXQX) Grande-Vallée project in Quebec's Gaspé region is perhaps the best example of a byproduct-sustainable project. But in some respects, you could say that REEs are the byproduct of Orbite's operation, since its REO production will be less than 1,000 metric tons per annum. Tasman Metals Ltd.'s (TSM:TSX.V; TAS:NYSE.MKT; TASXF:OTCPK; T61:FSE) Norra Kärr project in Sweden and Avalon Rare Metals Inc.'s (AVL:TSX; AVL:NYSE; AVARF:OTCQX) Nechalacho project in Canada's Northwest Territories are two other projects that can cover a major portion of operating costs and payback capital using revenue from byproducts alone. TMR: You wrote in a report, "Sifting the Winners from Losers Amidst the Impending Rare Earth Industry Shakeout," that "misleading metrics and ambiguous reporting practices have pervaded the REE industry." Could you elaborate? RC: The REE sector is rife with ambiguous and misleading project metrics, for example, basket pricing, which is the go-to practice of calculating a dollar-per-kilogram figure for contained REOs. This metric is abstract, opaque and in direct discordance with NI 43-101 standards. However, the compliant way of reporting, which is to calculate an equivalent grade referenced to one of the REEs that dominate a project's economics, such as the percentage of Nd and Nd equivalent, is even more opaque, I would argue, because it sheds no light on what is in the deposit other than Nd. Another opaque practice concerns costs-reporting, specifically the reporting of planned production capacity in "metric tons of REOs," versus reporting planned production capacity in "metric tons of REOproducts." The latter tells you nothing about the quantity of REO in the product (concentrate). It could be an REO product containing 1% REO, or containing 99.9% REO – the investor is left to make their own assumption unless it is specified elsewhere. Things get even trickier with some companies projecting costs on a "dollar-per-metric-ton of REO produced" basis, whereas others project costs on a "dollar-per-metric-ton of REO product produced" basis, which could refer to anything from low-grade bulk ore to a purified mixed REO concentrate. Here's an example: A project plans to produce 10,000 tonnes of REO concentrate (aka REO product) per annum. In this concentrate is 5,000 tonnes of REOs. Therefore, if it costs the company $1,000 per tonne of REO to produce, you could also say it costs them $500 per tonne of REO product, which looks a lot better. Now if the company doesn't reveal that the "REO product" is actually only 50% REO, then the reader or investor is left to speculate, or maybe even make inaccurate conclusions. Other confusion arises with some reporting their planned production in "tons" whereas most others report in "metric tons" or tonnes. Since REO prices are denoted on a dollar-per-kilogram basis, reporting in "metric tonnes" is most transparent in my opinion, but reporting in "tons" will naturally make your numbers look larger to anyone skimming through a news release or technical report. Another foggy practice is the way that projected revenues are discounted in technical reports for projects that aim to produce unseparated REO concentrates. Commonly they will discount by 15–40% for the anticipated cost of paying a third party to separate REOs from the material, but seldom offer justification for this discount rate, or specify exactly which third party will do the separation. TMR: Is there a best reporting practices code to which some but not all companies subscribe? RC: Best practices in reporting have been adopted by some companies, but they have not been formally adopted by the industry as a whole. Generally, the best practice is to be as transparent as possible. When companies discuss production in terms of "metric tons of REO product" and fail to mention what the REO grade of that material is, or what the chemical nature of the product is—for example, carbonate, oxalate or chloride—they are not being transparent and this is certainly not a best practice. TMR: Adamas Intelligence tracks the economic and technical development of 52 REE exploration and development-stage projects. With nearly every release in the sector touting success, how do you distinguish reality from hype? RC: Of the 52 projects that we track, 27 are exploration stage and 25 are development stage. Exploration-stage projects possess compliant resource estimates but lack preliminary economic assessments (PEAs), preliminary feasibility studies (PFSs) or feasibility studies (FSs). Development stage projects possess PEAs, PFSs or FSs but are still preproduction. All the projects we track have either NI 43-101-, JORC- or SAMREC/SAMVAL-compliant resources. With that sorted, we cross-compare and rank the projects by a suite of metrics that highlight their economic promise or lack thereof. 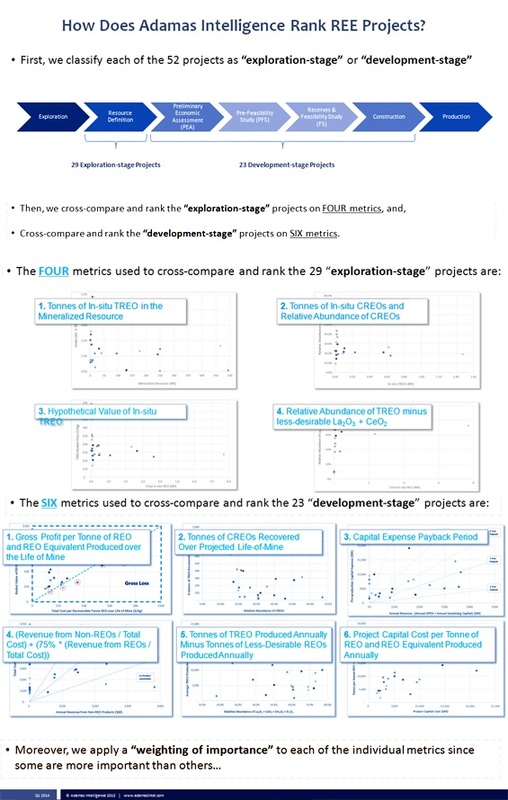 We then cross compare the 27 exploration-stage projects on four metrics and the 25 development-stage projects on six metrics and apply specific weights to the individual metrics, given that some are more important than others. Finally, we sum up the weighted ranks of each of these metrics to see how each project stacks up overall. The metrics and the ranking methodology are detailed in a presentation on the Adamas Intelligence website. TMR: What are the characteristics common to the projects that score highest in your ranking, and what are the characteristics common to your lowest-ranking projects? RC: Our top-five ranked development projects offer robust profit margins, timely payback on preproduction capital and the prospect of solid revenues from REOs as well as non-REO products. The most promising projects can endure REO price swings and will remain lucrative in a future marked by low REO prices. The lower-ranked projects tend to have smaller resources and lower grades. Thus, they have lower volumes of in situ REOs. If you consider that the average project requires around $804 million ($804M) in preproduction capital alone (thus, not including sustaining capital), it quickly becomes apparent to us that a greenfield deposit with only 10,000 or 20,000 metric tons of in situ REOs will struggle. It is important to say preproduction capital since projects also require sustaining capital during their lifetimes which is not included in this average.Other projects that didn't rank highly are those for which we anticipate low profit margins or losses. And there are also those projects with low relative abundances of critical rare earth oxides (CREOs) and heavy rare earth oxides (HREOs). Again, CREOs include Nd, Dy, Eu, Tb and Y oxides. LREOs include lanthanum (La) through gadolinium (Gd) oxides on periodic table. HREOs include Tb through lutetium (Lu), plus Y oxides. Scandium (Sc) is none of the above, but is considered a REE or REO nonetheless.